How much money did you lose in the 2008 market panic? How about the 2000 ‘tech wreck’? Or 1987’s huge one day drop? OK, let’s not dwell on your losses! But rather, think about this: what if you could have not only avoided those crashes… but actually profited from them? The secret is surprisingly simple. 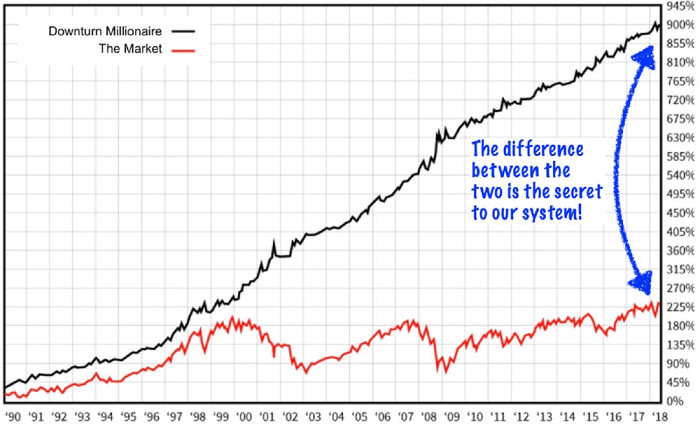 You find a system that not only keeps you in the market during the good years – but helps you short in the bad times. That’s what our Short the World ‘quant’ system does. Quant trading involves building systems that help you make decisions. You feed data in. The system crunches the numbers and spits out a signal. You follow it regardless of how you may be feeling. That’s vital. Quant trading only works if you’re willing to trust the system and allow it to guide you. Once you hit the system override button and ignore what it’s telling you, you introduce emotions to the mix – which is dangerous. More good news: by building a system you can test the strength of your algorithm. You can go back and find out what it would have told you to do in past situations. So you can quantify whether your system really would work in highly charged emotional situations… or not. That’s what Short the World is all about. It’s built around a proprietary system we’ve developed. Three decisions. No emotion. Just pure rational action. Look at that gap. The outperformance amounts to roughly 700% OVER ‘buy and hold’. Now this is ‘simulated past performance’. Essentially, it’s the results of our back-testing, when we applied our new system to the FTSE 100 every week over the last 28 years. Past performance is illustrative. You can’t rely on it when you’re making investment decisions. …you’re cold, calm and making money hand over fist. Information in Short the World does not constitute personal advice. Any recommendation should be considered in relation to your own circumstances. Your capital is at risk when you invest, never risk more than you can afford to lose. Commissions, fees and other charges can reduce returns from investments. Past performance and forecasts are not reliable indicators of future results. Exchange Traded Funds (ETFs) with derivative exposure (leveraged or inverted ETFs) are highly speculative and are not suitable for risk-averse investors. Spread betting – A short trade using spread betting carries a high level of risk to your capital. Spread betting is not suitable for everyone. Prices can move rapidly against you and resulting losses may be more than your original stake or deposit. Margin amounts vary between spread betting companies and the type of markets spread bet. Short the World is issued by Southbank Investment Research Limited. Registered office: 2nd Floor, Crowne House, 56-58 Southwark Street, London, SE1 1UN. Registered in England Company No 9539630. VAT No GB629 7287 94.